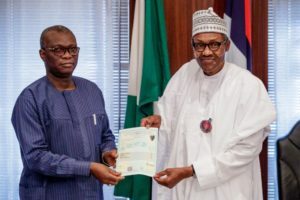 President Muhammadu Buhari has confirmed via his verified tweeter handle tweeter@MBUHARI that He received his attestation and confirmation of WAEC certificate from the Registrar of West African Examination Council Today. Today I received the attestation and confirmation of my 1961 West African School Certificate (WASC) Examination result, from the Registrar of the West African Examinations Council (WAEC). It was also an opportunity for me to thank WAEC for upholding its integrity over the years. As a Nigerian military officer, it would have been impossible for me to have attended the Defence Services Staff College in India in 1973, and, after that – in 1979 – the United States Army War College, had I not sat for the WASC examinations, which I did in 1961. The late General Shehu Musa Yar’Adua was my classmate. We spent close to nine years in boarding school, at primary and secondary levels. And from there, after our WASC, we moved to join the Army, where we had to take a military examination as one of the requirements.